The setting — the Bedouin fight against the Turks during World War I — is the same as in David Lean’s great epic. But this accomplished directing debut from English/Jordanian filmmaker Naji Abu Nowar is unusual in that it approaches the material from the viewpoint of an 11-year-old boy. “Theeb” (Jacir Eid Al-Hwietat) — his name is Arabic for “wolf” — is the third son a recently deceased sheik. His closest companion is his older brother Hasseim (Hussein Salaamed Al-Sweilhiyeen), who is teaching the boy in the ways of the desert. The Brit, evidently on a secret mission, asks Hasseim to guide him to a distant watering hole where he is to meet up with some Arab fighters. Disobeying his sibling, Theeb follows at a distance until he’s so far from home that Hasseim has no choice but to bring the boy along on the journey. The desert is always dangerous. In this case the perils are multiplied by bandits who prey on travelers. Russell Crowe’s acting is marked by fierce physicality and an equally intense intelligence. The Australian icon once again embraces those qualities in his feature directing debut, “The Water Diviner.” But the results are at best desultory. 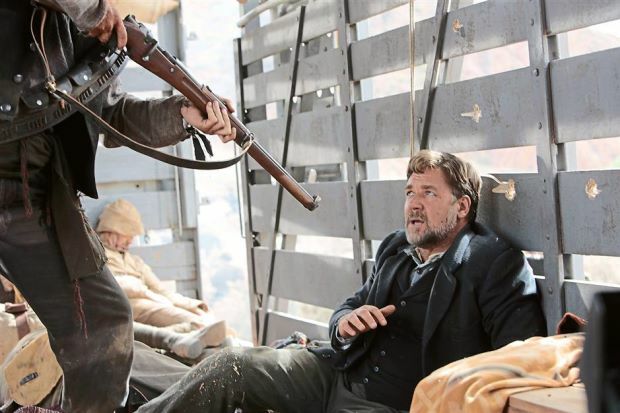 Maybe Crowe bit off more than he could chew in tackling this convoluted World War I yarn with epic ambitions. He certainly should have been more discerning when it came to the muddled screenplay by Andrew Knight and Andrew Anastasios, which throws together big themes, cheesy romance and an approach heavy on flashbacks. The film begins with the 1915 attack on the Gallipoli Peninsula in Turkey by British and Australian forces. After months of savage fighting and thousands of casualties, the invaders are repelled and retreat across the sea. Cut to Australia several years later where farmer Joshua Connor (Crowe) battles drought by using dowsing rods to detect underground water. He appears to have a real talent — possible psychic — for knowing where to dig. Joshua and his emotionally devastated wife (Jacqueline McKenzie) lost their three sons in one day of fighting on Gallipoli. With the death of his spouse, Joshua decides to honor her last wish — that her boys’ bodies be recovered and buried beside her. It’s a tall order. It means traveling to Turkey, navigating (or defying) the red tape of the British occupation, getting to the battlefield (from which civilians are banned because of the live ordinance still littering the landscape) and somehow finding three skeletons among the thousands buried in mass graves. If you think Joshua’s dowsing abilities will come in handy, you’re right. But there’s a lot more to this overly-busy yarn.